Kefalonia, Greece is one of the largest and greenest islands in the southern Ionian sea, famous for its many wonderful beaches, fine sand and calm, crystal clear waters. It’s an ideal place for scuba diving with underwater visibility exceeding 40 metres. The island’s characteristic giant rocks, great caves, reefs, walls, wrecks and rich underwater life provide numerous exciting dive sites for divers of all levels. Kefalonia is a unique island with natural beauty. 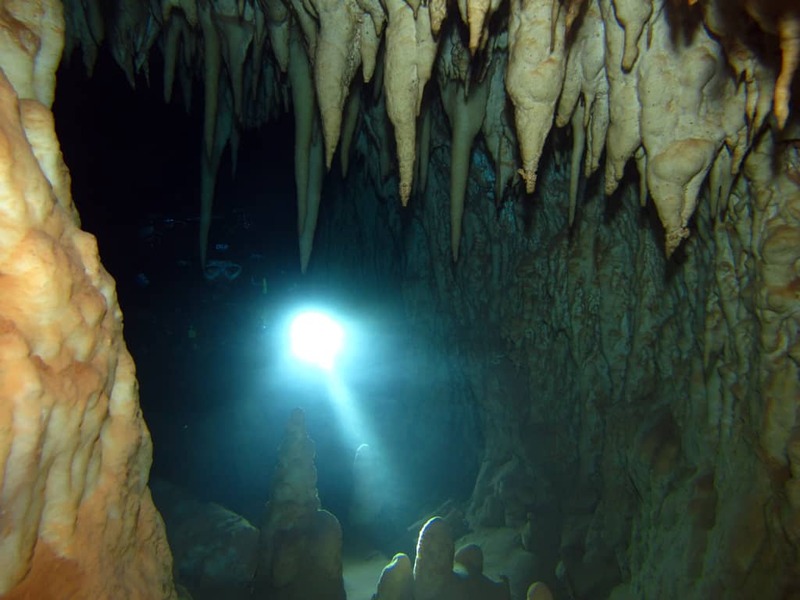 The caves of the island are specially known, some of them are over millions of years flooded with water and have been kept intact through the lapse of time with unique formations of stalactites stratifications – and unique stalagmites decoration. From the known caves, those who have easy access for public are: Melissani , Karavomilos, Zervatis. 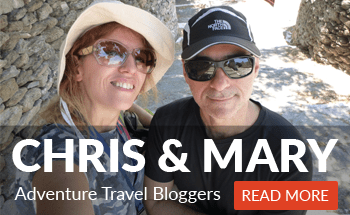 Other caves are Chiridoni – Sotira and Agia Eleousa with more difficult access that require descent with ropes. The brackish water is crystal clear with a constant temperature of 14 0C and in summer can reach up to 15 oC. MELISSANI : maximum depth of 30m expands to 540m, easily accessible through a drilled tunnel that drives visitors right in front of the lake. A dive (in the lacustrine part) suitable for all divers with relevant experience. 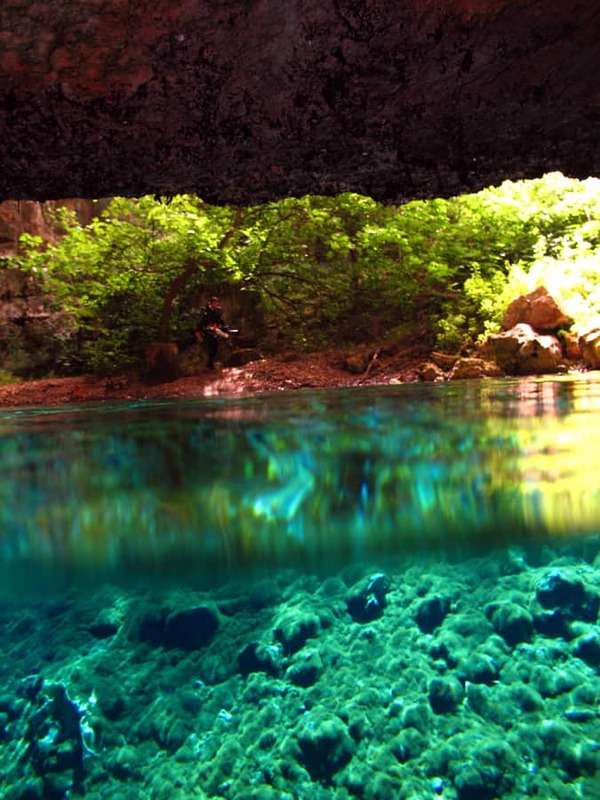 Diving in Melissani is a unique experience, the diffusion of light reflected to the walls and the crystal water gives a dreamy feeling and the illusion that of flying into the colors are really– image. This is a life long memorable diving experience. In the lake there are countless eels, sea basses, mullets and microorganisms that resemble to transparent shrimps, a characteristic biodiversity for all caves of Kefalonia. The average diving depth ranges from 15 to 24 meters Ideal for avoiding contact with the bottom of the lake. Time ranged from 35 to 45 minutes having a temperature of 14 oC. KARAVOMILOS: Maximum depth 16m that expands to 240m. Another unique cave with easy access, just 5 meters from sea with brackish water and temperature of 14 oC. The submerge consists of 3 parts. 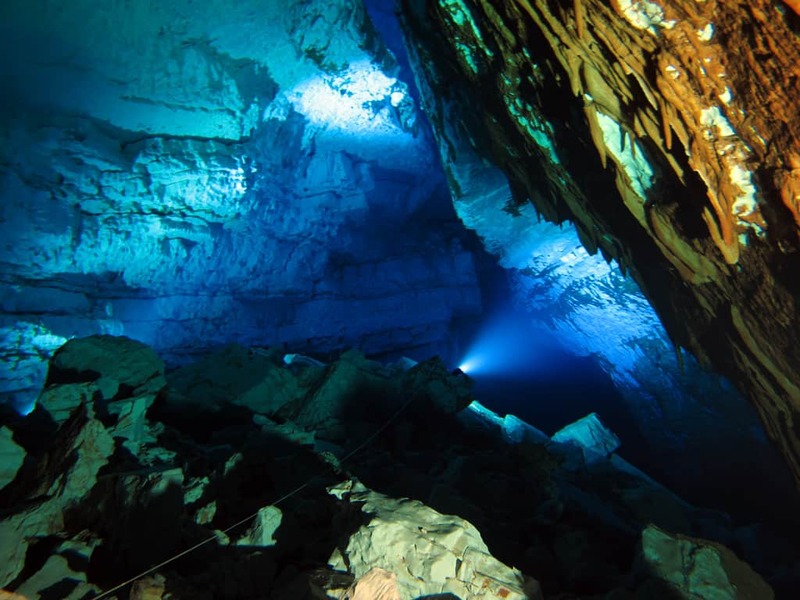 The first is the median of the lake that leads to the entrance of the cave accessible to all divers. 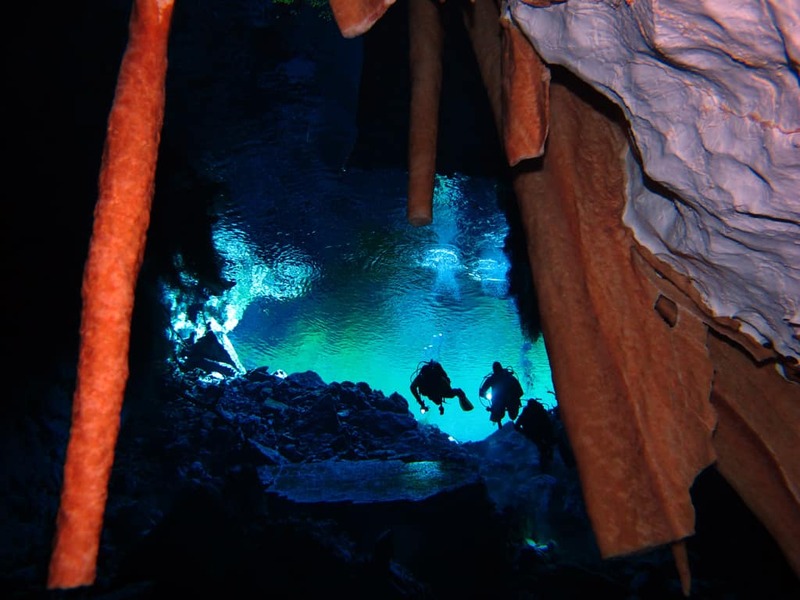 From the entrance to the second and third part of the cave Cavern and Cave level diving certification is required. Diving in the lake is unique because of its excellent biodiversity, development and size of underwater fauna that is impressive within the crystal water. The photosynthesis process is obvious and O2 and other gases production can be seen with the appearance of small bubbles. The lake communicates with the sea and is filled with schools of sea bass and mullet fishes. After the cavern part that consists of 2 large chambers forming a “L” shape for about 80 m, follows the cave part that shows schools of fish using the dark part of the cave for protection. The combination of biodiversity towering stalagmites and stalactites curtain, gives the picture of a sea cave with land cave features. The cave, evolves a geological marvel that only pictures can fully explain, giant colorful stalagmites appear as if they want to touch the roof of the cave. Strange stalactite formations extend around the cave with giving a sense of magic decoration. ZERVATI: with maximum depth of 7 meters that expands to 150m. An other cave with easy access since most of the roof air pocket. The land wild flora and the surrounding rocky environment gives an unexpected Jungle feeling. Inside the cave the visibility is so incredible that the land environment of trees and vegetation can be seen by the divers underwater. 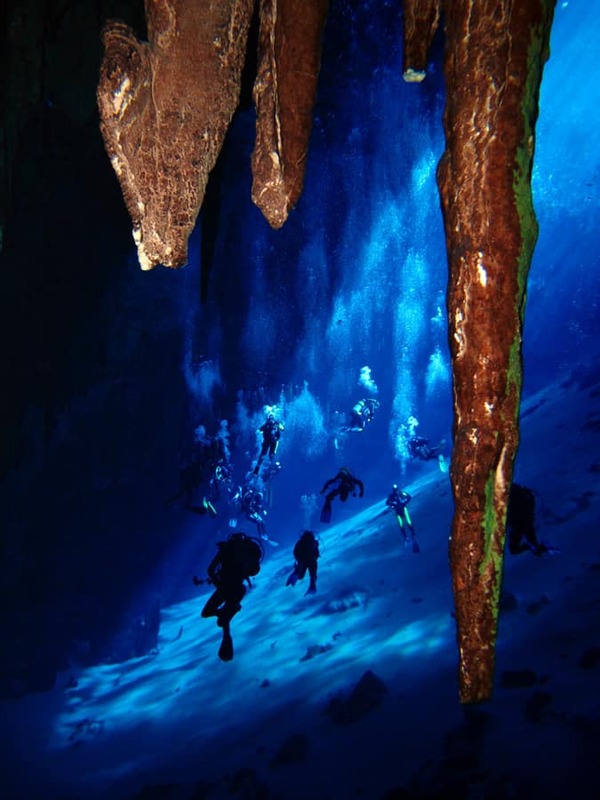 The limited depth and spaciousness of the cave, makes it ideal for introduction to the Cavern Dive. Sea basses and eels are live in the cave water that communicates through small holes with the other caves of the area. 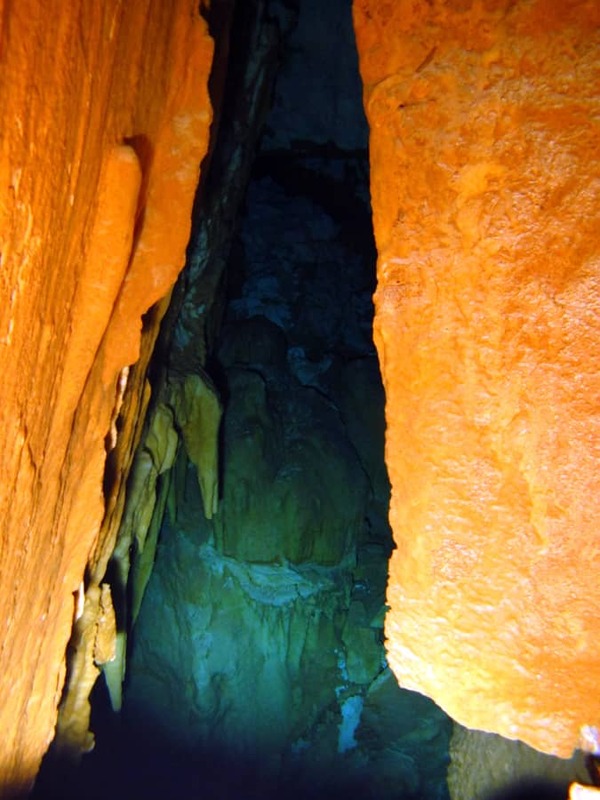 The central area of the cave is a large chamber with air, which climbs vertically to the surface of the land for several meters forming a huge chimney. The brightly colored walls give an excellent opportunity for great pictures. The British submarine located in the southern Kefalonia , sunk by a mine on Dec. 6, 1941. A challenging dive, that offers to the diver a unique diving experience facing one of the most impressive war machines of Second World War. The submarine lies at a depth of 51 meters , while maintaining absolute shipbuilding shape, revealing a huge metal giant that offers protection to the underwater life. Big amber jacks and dentexes fish appear unsuspected around the wreck that extends for about 80 m above the sandy sea bed. The story of HMS PERSEUS is truly unique and has been studied from many historians and researchers. The conditions of its immersion as well as the presence of a single survivor (J.CAPES), who was not a member of the crew, make the legend of the sunken submarine even more mysterious . This wreck dive is ranked among the top 10 dives around the world . This is a contemporary wreck of a small Ferry Boat of 40m that sank in 2011 near Agia Kyriaky bay. This is an easy dive at 20m depth, where divers may see the whole boat at the sea bed. Three trucks sunk with the boat and can be also seen as the spread down. 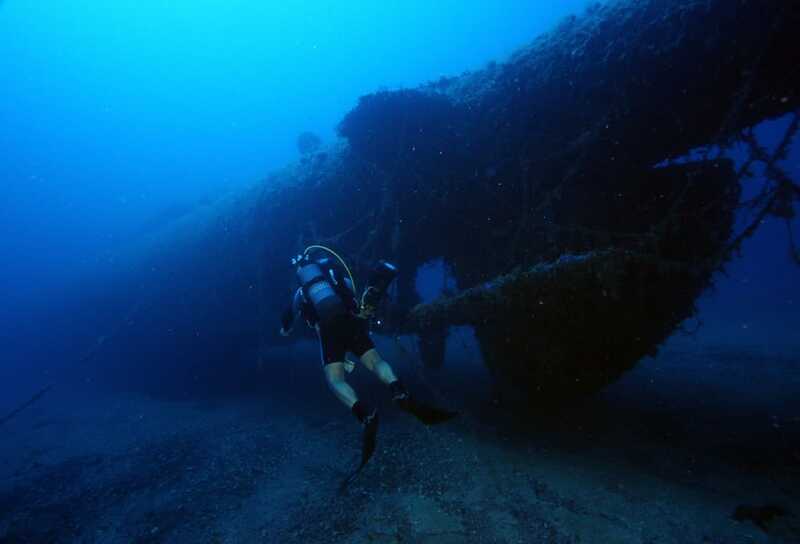 It is an ideal chance for easy wreck diving and even though it is a contemporary wreck it has developed into an impressive center of marine life. Got amazed? 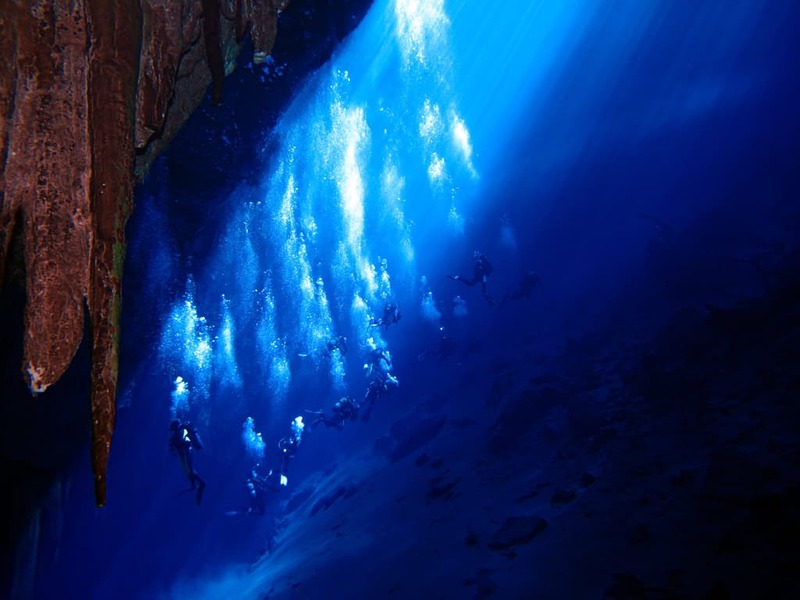 Well, visit and enjoy Scuba Diving in Kefalonia. An island ideal for a lengthy stay. Aquatic Scuba Diving Club, is a premium Diving Club in Kefalonia, established in 1997 in Agia Ephimia. It is a PADI Resort and CMAS traing diving facility. The premier scuba diving facility on Kefalonia Island Greece offers a full range of training courses and dive packages for qualified divers and complete beginners. Catering for both divers and their families ensures that “our friends” will return year after year to enjoy the professional, friendly atmosphere at Aquatic Scuba Diving Club. Let one of our experienced Instructors or Divemasters show you the abundance of life and colour of the crystal clear Ionian Sea. All resident instructors are professionals with a vast experience in diving and instructing, and a commercial diving background. Aquatic Scuba Diving Club has strived to offer the highest quality service to thousands of divers. Our dedication to high safety, our hospitality, comfortable facilities, the friendly atmosphere and our highly qualified experienced staff has established us as the top diving facility in Kefalonia. Post by Aquatic Scuba Diving Club – Kefalonia – Greece. Contact the organizer through: +30 26740 62006 or through their contact data below.